Free Amazon Prime Music - Worth it? Initially, at least, Prime Music offers a paltry one million or so songs; Spotify and other major streaming services have over 20 million tunes in their libraries. But quality matters more than quantity. Right? Amazon must be saving listeners time by offering only the very best music. Oops. Last week, nine out of the top 10 tunes on the Billboard 100 popularity list were missing from Prime Music. So much for the time-saving theory. It made no logical sense, anyway, given that Amazon built its popularity in the book trade by carrying every obscure title in existence. People hate to search and come up empty; that is what they perceive as a waste of their time. But it really doesn’t matter that Prime Music’s playlist is subpar. It won’t matter if the user interface is more clumsy than that of other music streamers. It’s free; that’s what Prime members will believe, and so it’s a net gain for them, a gift from Jeff Bezos. As far as most Prime members are concerned, they’re paying $99 a year for free two-day shipping. Everything else is gravy: free streaming videos, free Kindle eBooks occasionally, and now free streaming music. Only nothing is free, overall. "Hey Buddy, That's *ALL* You Can Eat!" When I was in college, a local restaurant offered a Sunday all-you-can-eat buffet that included boiled shrimp, a pricey delicacy that I normally couldn’t afford the aroma of. A tall, skinny friend and I made a bet on who could eat the most shrimp. Halfway through the contest, the waitresses ganged up to scold us for being such thoughtless gluttons. It’s been estimated that Amazon makes a double-digit profit on Prime membership fees if you only count shipping costs. A lot of people, it seems, never use $99 worth of shipping in a year. They buy a Prime membership just so they don’t have to stop and think about shipping costs when they shop. Only a handful of members come out ahead on “free” shipping that actually is $99 worth of prepaid, use-it-or-lose it shipping. I have no problem with Amazon making money. And I'll admit that the free Prime shipping at Amazon does often motivate me to shop there first. But lately I've found that on some "free shipping with Prime" items, the shipping costs seem to be built into the price. For example, an item that other vendors are selling for $10 plus $6 shipping, sells for $16 on Amazon with "free shipping." How is that saving me money? The addition of music to the Prime portfolio of freebies (that cost $99/year) will persuade some non-members to sign up for Prime, fattening Amazon’s bottom line. New members who have been on the fence will pay for Prime because it suddenly hit their threshold of taste for “free.” Adding new members is the only reason Amazon added the other freebies to Prime membership. It worked then, and it will work now. Will Streaming Music Soon Cost More? Have You Tried VLC Media Player? What is VLC Media Player? Most recent comments on "Free Amazon Prime Music - Worth it?" I have subscribed to Prime for a long time and love it. Buying on the internet saves me time and gas and frustration when you get to a store and they don't have what you want. I easily make back the money I have put in. It was the same price for many years even as shipping prices have gone up everywhere so I am not surprised or disappointed with the raise in price. Some of the items we have purchased would have had a shipping price of $20 for that item alone without prime. I enjoy the ebooks for my Kindle and we have been watching some movies and tv shows. We are really enjoying that part. And just on Saturday, I started using the Prime music. They have plenty that I enjoy, and they have said they will be adding more as time goes by. In addition, it give me the opportunity to listen to things I might not otherwise hear. It may not be for everyone, but we love Amazon Prime. I would prefer if they had two offerings: Prime shipping and Prime Plus (with video and music). I don't need the video or music. I have a ton of videos on my cable system and I have netflix(and the Amazon Prime video doesn't work with my Chromecast). It's not the free shipping -- it is the free two day shipping (sometimes one day). Yes I can pay for shipping but two day shipping is usually very expensive from most merchants. $99 is getting a little steep. And now I am using Google Shipping Express (same day and free for those of us lucky enough to be in one of the few cities they support). Like any other product, it's worth it for some but not for others. It just depends on your 'needs' and 'wants'. Without getting into Prime membership, I appreciate that Amazon has much mp3 music not available readily on CD; otherwise I would buy it that way. I am talking about "ancient" music, the kind people actually played on instruments, not replayed digitally (i.e. jazz and American roots). Google Play is good too although I have not checked out my cart there yet. Both leave much to be desired in terms of scanning your computer to include files that you have on your computer but did not buy from either site. Normally I get so much from your posts, but you are way off base with this. Check out Amazon's bottom line on their financials. They are losing money. But all that aside, the Prime Shipping is well worth the investment. I have been an online shopper since before the world wide web, and shipping has always been a deciding factor in my choices. Over the years I have purchased many large items, and as an example, a Stott Pilates Stability Chair (weighs a ton!) and a tread mill, both of which were free shipping, and well paid for the annual Prime fee, which, by the way, was raised for the first time in years, not even keeping up with the high cost of gas these days. Amazon is pretty much my one stop shopping place, due to their competitive prices, free shipping, and best of all customer service. My last renewal for Prime came right before the price increase to $99 so this might be my last renewal. It's a value because I can share it with family members in the same household and even outside of the household! I share my membership with my mom who lives in another state and we split the cost of the membership. I also share it with my husband and son so I think among all of us, it's a decent value at the old price but I don't think any of us shop enough combined to make it worthwhile at $100. I enjoy getting the one free ebook each month, I don't use the videos or the music (I have iTunes radio and too many other free options for that to be useful). I would find more free ebook options valuable if it was included but I don't see them doing that. We were sucked in by a "try Prime for 30 days free" deal last summer because they were the only ones who were streaming a TV show we were hooked on. At the end of the 30 days, we subscribed. And you know what? We absolutely love it. We also have a Netflix membership, and sometimes when Netflix doesn't have something we want to watch, Amazon Prime will, or vice versa. We definitely take advantage of the shipping. The addition of music will be a boon for us. As sirpaul2 says, it's worth it for some but not for others, depending on your needs and wants. If ( and that's a HUGE "IF" ! ) would tell Mr. Bezos what he could do with his "Prime" membership and the 29% increase in it's cost from $79 to $99. Not to mention the non-existent savings he's built in the final cost of item ordered ( to cover said free shipping charges ) what he could do with his "Prime" account and all the "Benefits" that aren't anything to look at twice .... maybe, just maybe ... he'd forget his little "Pet Gimmick" ( and that's all those so called "Freebee's" are, and give us the consumer cost breaks that built his empire in the first place. Marketing department gimmicks have sunk many a promising company, and his is looking better and better to the promising future competition lurking at those greedy eyes. Yes "Prime WAS a decent concept UNTIL Mr. Jeff got greedy ... the 'bane' of many who've drowned in that greed. I tried Amazon Prime at the urging of my daughter-in-law, but will not be renewing. The only thing I use it for is the "free" shipping & I don't even order that much from Amazon that requires shipping. I order many books for my Kindle, but don't use the perk allowing Prime members to read books without buying them. If I like a book, I want to have it handy to re-read. Also, you're only allowed to read one free book per month & I finish a book in 2 or 3 days. I probably would have kept my Prime membership if Amazon had not instituted their enormous price increase. Spotify? It screwed up two of my machines. Too much spywaare, malware. Avoid it like the plague. Im fine with Prime. You forgot to mention you can read Kindle books one free every month. Shopping on Amazon is like unto the Costco experience. How does one get out of the store for under $100.00. I can't think of anything that I would want next day delivery on....except toilet paper. And I have never even seen that on Amazon. Prime is a prime example was throwing money away. Yes, frequently the price does seem to be enough higher to cover the shipping. However, as someone pointed out it's not the matter of free shipping but of free 2 day shipping. My family and I have used Amazon Prime 27 times in the past year for shipping. This comes to $3.67 per shipment at $99 per year. I feel that $3.67 is worth it for the 2 day part if nothing else. Recently I needed the item in one day instead of two. It cost me an extra $3.99 to get it in one day. For me Amazon Prime is great. Yes I occasionally watch a movie of TV show but for me the shipping is what it is all about. I will pay the extra $20 because I probably use that much "free" shipping. But I also get "free" access to movies and TV shows that I use often. I haven't checked out the "free" music yet but I consider the other "free" services to be worth it. I am still in my first year of Amazon Prime and I have no problem with their charges. I use the two-day shipping option regularly. Yes they are sometimes the same cost as REGULAR shipping, but I live out in rural Eastern Washington and two-day shipping is an expensive premium with all online retailers I am aware of if it is offered at all. If something is significantly cheaper elsewhere and I don't need the product right away I go elsewhere. If the price is the same is still get it faster with Amazon. 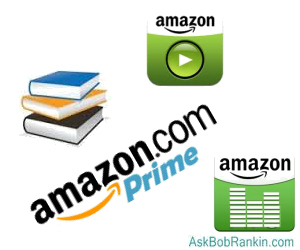 I also use the Amazon Prime videos regularly and really like a few of their original series. I was planning to keep it at the higher rate even before they added the extra perk of music. I may cancel my DirecTV, but I will keep Amazon Prime and Netflix and may even re-up for Hulu Plus which all totaled will still be far less than my monthly cable bill. I've been a Prime member for about a year. I didn't join for the "free" shipping. I joined because of the Prime Video. The shipping and music are gravy for me, although I find myself ordering stuff from Amazon more often, about two to three times per month. @Steve --- I am a Premium Spotify member and I do NOT get any ads or spyware. I didn't get any spyware, when I was using the Free version of Spotify. Please, state that you are using the Free version, so people can understand better. I am very pleased with my Premium Spotify. Yes, it costs $99 a year, but for me, it is well worth the money. I have 2 daughters that can "access" my account, but, only one person at a time, can use Spotify. I have NO problems with this "ruling." It is only ONE account, so only ONE person should be using it, at a time. All 3 of us, have a huge music list and it is wonderful to see, what my daughters taste in music really are. They are as eclectic, as I am ... Ranging from Country to Rock to Christian to Funk to R&B to Classical and Oldies but Goodies!!! There's more reader feedback... See all 43 comments for this article.